Stop Making a Mess on the Floor Dip and Drain Baskets are the cleanest, easiest way to manually wash dirty or oily parts. 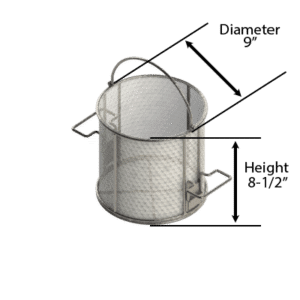 Simply fill the basket with parts, dip the basket into a bucket of cleaning solution, swirl and dunk the part to clean, then flip out the Dip and Drain Feet to support the basket over the bucket while they drain. 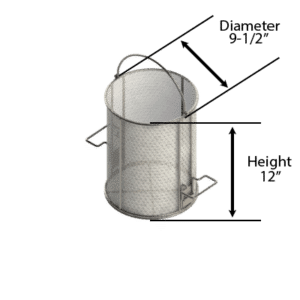 Our elegantly simple Dip and Drain Feet swing under to let the basket be dipped into a standard-sized pail filled with solvent or cleaning solution. 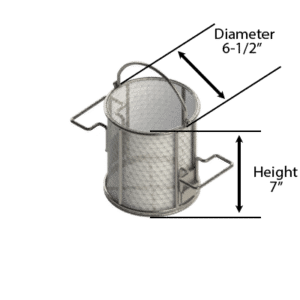 After dunking and swirling the basket to clean the parts, lift the basket and swing the feet back outward to support the basket just below the top rim of the bucket to let the parts drain. All of the extra solution drains back into the pail. Because of the unique shape of the Flip Out Feet, the basket is stable with the feet out or with the feet tucked under the basket. The feet swing easily with spring catches to hold them in the “full out” and “tucked-under” positions. Our rugged, industrial grade construction holds up to tough real world use.